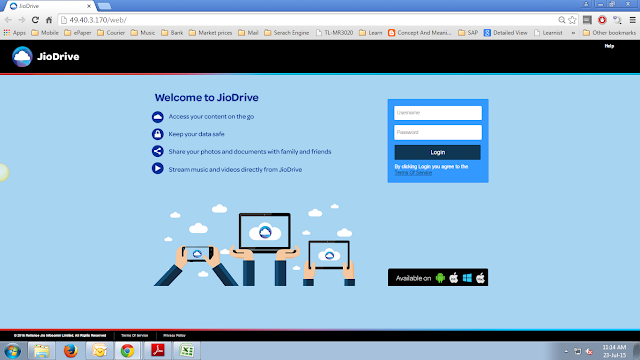 Jio Drive is available across multiple platform ranging from Android, iOS, Windows/MAC desktops and on the web. Jio drive comes with a simple interface and you can login with your Jio ID(same across all Jio services). Jio Drive acts more like an backup tool with option to do automatic backup of your device content. It can backup your Photos, Videos, Music, Documents and Contacts. You can even choose to backup photos as soon as they are taken. There is also options to select how to backup(WiFi/Mobile Data) and when to backup(Hourly, During the day, Once in Night). You can also upload individual files without enabling backup. The only drawback is you can only upload Photos, Videos, Music and Documents. This is were Jio Drive set apart itself from other cloud storage services. While OneDrive and Google Drive offer 15GB free storage, Jio drive comes with a whooping 100GB* free storage ( as per sources) . If that is not enough, you can also have option to upgrade to higher plan. Details of plans are still not revealed by Jio. Finally we have a true Indian online storage service with data hosted on servers located in India. That too without compromising on storage or quality of service. Next time you loss your mobile phone you don’t have to worry about all your photos and videos as they are secure on Jio drive.